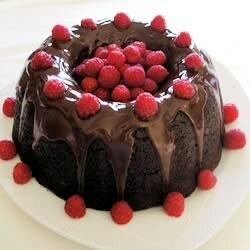 "Moist and delicious, this rich chocolate Bundt cake with a hint of almond is a triple chocolate treat." Preheat your oven to 350 degrees F (175 degrees C). Grease a 10-inch Bundt pan. In a large bowl, stir together cake mix and pudding mix. Make a well in the center and pour in sour cream, melted Melt(R), eggs and almond extract. Beat on low speed until blended. Scrape bowl, and beat 4 minutes on medium speed. Blend in chocolate chips. Pour batter into prepared pan. Bake for 50 to 55 minutes. Let cool in pan for 10 minutes, then turn out onto a wire rack and cool to room temperature. So delicious! Made this cake for my roommate's birthday and it was a huge hit. One of the best basic chocolate cakes I've had!